Signed & dated ro. mount (l.l.) in pencil: "Cöln 1922 (IV). Markings: Ro. print (l.l.) blind stamp No. 2a. Label: Label No.3d vo. mount (u.l.). Gottfried Brockmann, a young painter associated with a group of artists known as the Cologne Progressives, leans forward with his head slightly tilted. The feminine manner in which he holds his cigarette and crosses his legs breaks all traditional rules of masculinity. 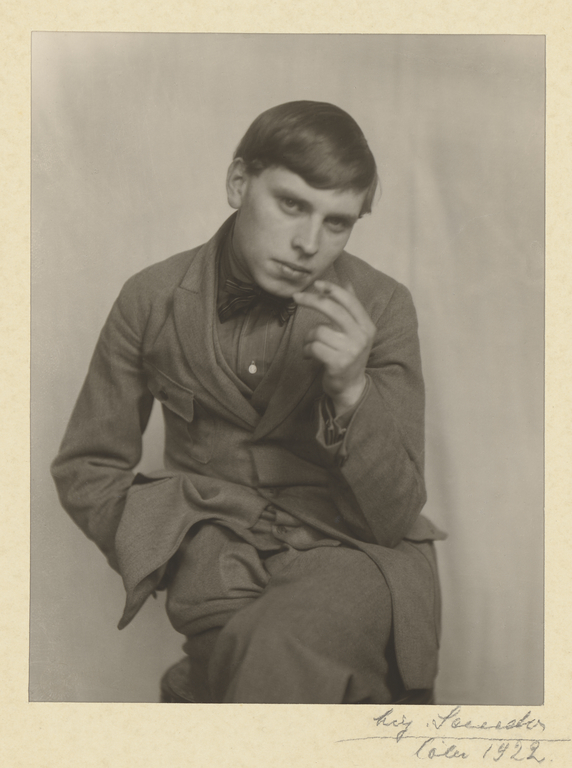 August Sander's portrait of the artist he called a bohemian suggests that gender roles in Weimar society may have been far more fluid and complex than even he imagined. August Sander was a close friend to many of the young artists in Cologne, frequently showing his photographs in their exhibitions, or trading his images for their paintings. Indeed, Brockmann lived with Sander's family for almost two years, during which time they had numerous discussions about the political, social, and aesthetic concerns of the day.